Despite nearly one year’s worth of posts about parasite ecology, this blog has never defined the term ‘parasite.’ D’oh! You might think, “Pft, the definition is obvious!” But actually, it isn’t, and it isn’t without controversy, either. I’m going to talk about a bunch of types of natural enemy, and then I’ll present a really good dichotomous key at the end. 1) One predator eats multiple prey during the predator’s lifetime. 2) Predators tend to be bigger than their prey. 3) Predators tend to kill their prey. You’ll notice that I said that predators “tend to” be bigger than their prey and “tend to” kill their prey. They don’t always! A very good example of this is a vampire bat that takes blood meals from cows. A single vampire bat will take blood meals from multiple cows during its lifetime. It is eating multiple prey, therefore, it is a predator. But it doesn’t kill the cows, and it isn’t bigger than them. It’s a micropredator. Parasites are different from predators because parasites only take resources from one host, whereas predators eat many prey. A good example of this is the trematode parasite Schistosoma mansoni. An adult schistosome parasite lives inside of just one human host. It is never going to crawl out and go infect a different human. 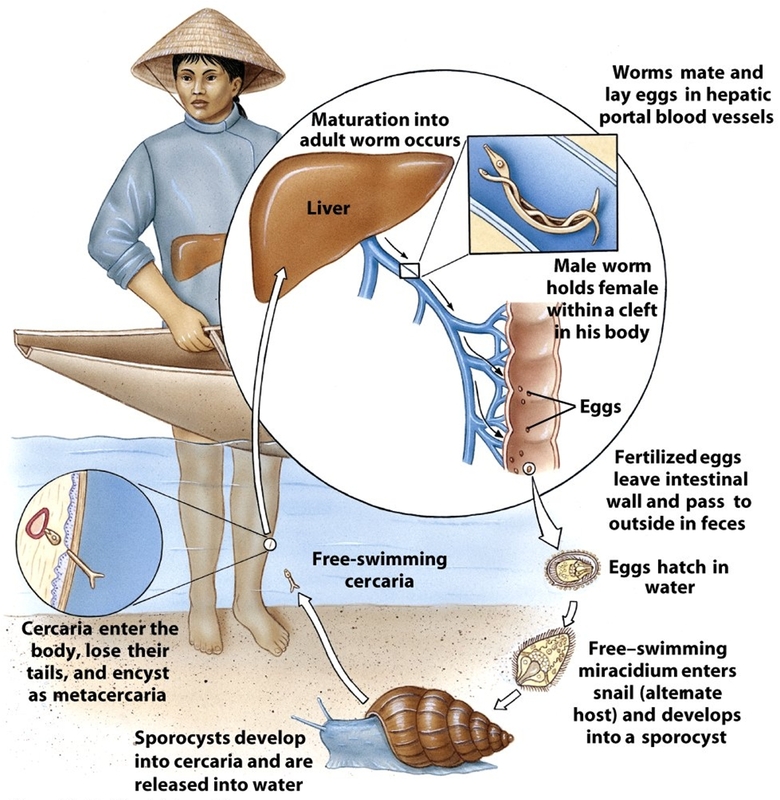 You might be thinking, “Waaaaait… Schistosoma mansoni has a complex life cycle! It infects humans AND snails! That’s two hosts!” Yep. But the rule is that parasites only infect one host during each stage of the life cycle. One human. One snail. 1) They are smaller than their hosts. Ok, so, the killing bit is confusing and wishywashy. I’ll come back to it below. Like a parasite, a parasitoid infects just one host per life stage. But parasitoids always kill their hosts. So, what’s the difference between a parasite and a parasitoid? If you’re about to take an exam or something and you want a quick answer, say that parasitoids always kill their hosts and parasites don’t usually kill their hosts. You’ll find that in many introductory ecology textbooks. In practice, we don’t really use that definition. The term parasitoid is usually applied to certain insects that have free-living adult stages that lay eggs inside a host, and the eggs go on to parasitize and eventually kill the host. There are many “parasites” that always kill their hosts, and we still call them parasites and not parasitoids. Why, Scientists? Why do you do this thing? Well, it just doesn’t make sense to have a rule that says that parasites don’t kill their hosts. For instance, if a parasite (say an acanthocephalan) in an intermediate host (a pillbug) makes the host more likely to get eaten by the next host (a bird) in the life cycle, then the parasite is often the cause of the host’s death. Those kinds of parasites are called trophically-transmitted parasites. Figure adapted from Lafferty and Kuris (2002) – link below. You might remember from one of my previous posts that we tend to divide parasites into microparasites and macroparasites. As I described in that post, for microparasites, we care about presence/absence of infection, and for macroparasites, we care about intensity of infection. The fourth dichotomy used by Lafferty and Kuris (2002) is “does the enemy cause intensity-dependent pathology?” They include the fourth dichotomy in their figure. It’s really useful, but I didn’t include it here to avoid confusion. Click the PDF link below to see their version. This entry was posted in Cool Literature and tagged definition of parasite, micropredator, parasite, parasitoid, predator, what is a parasite by dinoverm. Bookmark the permalink. Very nice post, and you are brave to attempt to dichotomise. I tend to avoid it when possible! I often refer to bacteriophages as parasites, but others refer to them as parasitoids (which I don’t like because they are reproducing rather than simply developing within their hosts) or predators (which I don’t like because of the one host rule you describe above). One question for you – there are many bacteria and fungi that produce spores that are only released at host death (for example, daphnia parasites) but are not trophically transmitted. How would you classify these? Strictly speaking, the "zombie fungus" that attacks ants is not a parasite but a predator, as it kills its host. Like you, I don’t consider Cordyceps to be a predator because of “Dichotomy 1.” I think we can at least say that we know which box in the diagram we fit these host-killing parasite-things into: they infect just one host, they always kill the host, and they (probably) reduce host fitness to zero. 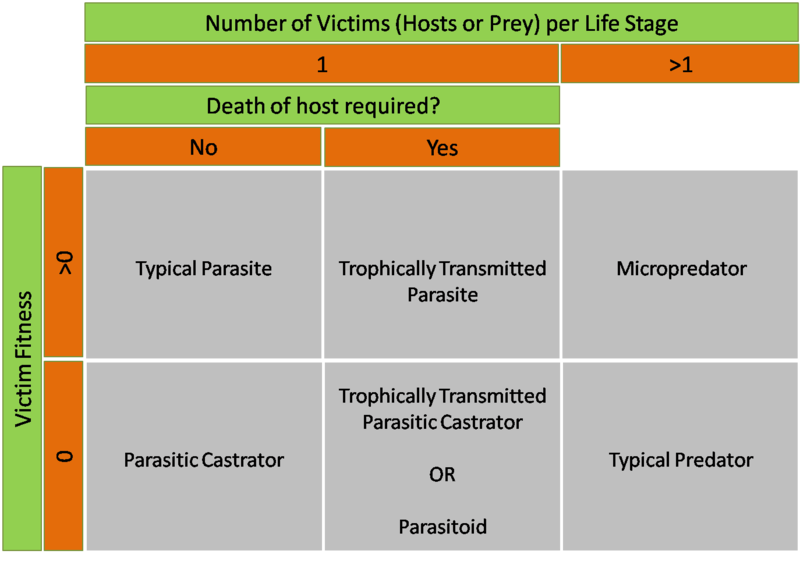 According to Lafferty and Kuris (2002), that leaves us with two options: “trophically transmitted parasitic castrator” or “parasitoid.” Like you said, “parasitoid” isn’t a great option, because parasitoids and Cordyceps have quite different life histories after the host-killing part. And like you said, Cordyceps obviously isn’t trophically transmitted. So, clearly, we need to divide that box into more segments!! Lafferty and Kuris (2002) already use the presence/absence vs. intensity dichotomy. I find it interesting that parasitoids, which are so macroparasite-ish in most regards, end up having intensity-independent effects on their hosts. They’re obviously atypical ‘microparasites.’ I think the answer to your question is that we need a term for the other microparasites that fall in that box. That is, we need a term for microparasites where high virulence is adaptive. Then we can put your bacteriophages, Cordyceps and similar zombie-ant-making fungi, HIV, maybe some waterborne bacteria like Cholera, and maybe some vectored microparasites into that group. Now the question is, where do we put microparasites that fit the “accidental virulence” bill? For instance, many of the highly virulent fungi only end up in hosts accidentally, and so killing the host is not particularly advantageous. So I guess they would go in the box where the death of the host isn’t required but fitness is reduced to zero? Then we’d need a new term in that box, too! Long story short, I guess we need a fifth dichotomy regarding the evolution of virulence. Is it adaptive, accidental, or was there evolution towards intermediate virulence? I found a more recent parasite classification scheme by Poulin (2011) in Advances in Parasitology. His classification scheme is based on the number of hosts used per generation (i.e., complex life cycle or not) and the number of hosts used per life stage, the effects on host fitness, and whether the host dies. He ends up with six categories: parasitoid, castrator, directly-transmitted parasite, trophically-transmitted parasite, vector transmitted parasite, and micropredator. He explicitly puts Cordyceps in the parasitoid group. And thanks for that second paper, I’d not read it. It seems to me like one good solution would be to some good theoretical modeling and determine where the critical break points are in terms of shaping host-__________ <- (insert choice descriptor here) dynamics. I would prefer a classification that was meaningful in terms of disease ecology and evolution. The thought experiment suggests it would include factors like virulence, number of within-host generations, number of hosts required, and perhaps even host specificity. Anyhow, I'm glad you've highlighted the debate! unecessarily complex/long winded. a predator kills swiftly whereas parasites kill slowly if at all. It is a time based distinction entirely, let us not complexify the simplistic but simplify the complex as alexandra said to the gordian knot. I have a post coming up (March 18-ish) about the “time distinction.” Parmentier and Michel (2013) propose a simplified classification scheme based on both the relative duration of association (time distinction) and the relative fitness cost imposed by the enemy (predator/parasite/parasitoid). I think you need the fitness axis, rather than just a time based distinction, because not all predators kill their victims. Also, as I’ll point out in the post, I think that different classification schemes will be appropriate in different situations. The simplified scheme of Parmentier and Michel (2013) might be much more useful in a general educational setting than the one that used in Lafferty and Kuris (2002). Parmentier, E., and L. Michel. 2013. Boundary lines in symbiosis forms. Symbiosis 60: 1-5. Only one definition of a parasite is always correct: What parasitologists study. That will make a pretty short paper, but I think you should publish it. In my Principles of Entomology class, I learned that parasites can and many times do feed on more than one host. Taken as a quick example from the supplied source, The Asian Vampire moth, Calyptra eustrigata has piercing and sucking type of mouth parts. Like a mosquito, it is a blood sucker on a variety of mammals including humans. Thanks for your comment, Christine! If they feed on more than one host during a given life stage, they aren’t parasites – they’re micropredators. This is a common misconception!